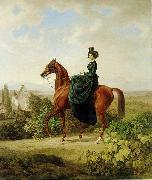 1786-1862, was a German painter of battles and horses. Born in Nordlingen, he began an apprenticeship as a confectioner and went in 1803 to Nuremberg to begin his training. However, influenced by the director of the Academy of Fine Arts of Nuremberg and later by Johann Rugendas, he turned towards painting - mainly battlefields and horses. After participating in the Austrian campaign of 1809, he stayed for a time in Vienna, where he drew the attention of Napoleon's stepson Eug? ?ne de Beauharnais and was appointed his court painter. Most of Adam's subsequent works deal with Napoleon's Russian campaign, in which he participated under de Beauharnais. Among other works, he painted a diary of the campaign in 83 scenes. In 1815, Adam moved to Munich, where he was occupied by the emperors and kings of Bavaria and Austria. His studio in Munich was frequently visited by Theodor Horschelt, who later became well known for his paintings of Russian Caucasian War. He worked until a great age, recording battles and portraying horses, even though in his late works he was supported by the help of his sons, Benno, Eugen and Franz. He died in Munich.